Over the decades the reputation of the samurai has grown to mythical proportions, owing to such films as Akira Kurosawa's Seven Samurai and Yojimbo as well as works such as James Clavell's epic Shogun. In Legends of the Samurai, Hiroaki Sato confronts both the history and the legend of the samurai, untangling the two to present an authentic picture of these legendary warriors. Through his masterful translations of original samurai tales, laws, dicta, reports, and arguments accompanied by insightful commentary, Sato chronicles the changing ethos of the Japanese warrior from the samurai's historical origins to his rise to political power. 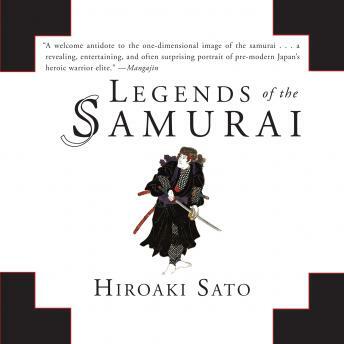 A fascinating look at Japanese history as seen through the evolution of the samurai, Legends of the Samurai stands as the ultimate authority on its subject. Cringe! This has to be the most painful book I’ve ever had to listen to. The narrator slaughtered, butchered, the Japanese language and there were many pages where Japanese poetry and quotes were read and I just had to skip through those pages. I couldn’t listen to it anymore. If you are going to narrate a Japanese story you’d better make sure you at least have the fundamentals of the accent down. This was shameful, especially as you probably figured out, many Japanese people would be listening to this book. The awful accent and cultural insensitivity of the narrator totally negated any interest I had in this book. I’m sorry I bought it.